"It was the best staff party we've had in years, everyone enjoyed it [All at Sea] and thank you very much! I have passed your details on to others, and praise you for keeping the costs affordable and the games fun!" "I was delighted with the effort put into the costumes [All at Sea] – as you can see above, people really got into the spirit and created a good atmosphere! All in all, an enjoyable evening. I'm hoping we can do another one next year. Thanks again for all your help." "Overall, I really enjoyed All at Sea. I ran it for my 30th birthday party and everyone had a great time. I have family in the entertainment business and they were able to provide a large variety of props that helped set the mood and scene for the game. It felt like we were setting up for a movie. Once everyone became familiar with their character details and the rules of the game, everyone really seemed to take on their own character and had a great time. Many people came dressed in character. I had one of the most memorable nights of my life and it is a birthday I will never forget. Thank you for providing such a fun evening." "I did have a fantastic time as the host [with All at Sea], I think it was the best position to be in. All our guests had a brilliant time and there was not anyone who did not enjoy themselves." "The [All at Sea] evening was brilliant… it took a lot of organising, as I'm sure you know, but it was very much worth it… everybody entered the evening in character and we all had great fun." "All at Sea was a great game that made our evening. Everyone was thoroughly engaged, and had fun! Dressing up made it a really enjoyable experience, and added to their characters. Everyone of all ages was able to play the game (some with a little more help!)" "All at Sea was my daughter's 18th birthday. She has been having these parties since she was 13. It was so fun to see how quickly the kids who had come before got into the game. The kids who had never played before were a bit nervous at first but they soon got into it. For just plain fun you really can't beat a Freeform Games mystery party. As they were leaving the guests were asking when we were going to have another one. Really you guys are doing a great job. I tell everyone about you – even the people I met in the thrift store when we were buying the costumes." "All at Sea was an excellent evening and a complete success. Everyone had a wonderful evening. We did find that the plots were a bit complicated for some of the younger players, but it didn't spoil the enjoyment for anyone. Everyone could be as involved as they wanted. Most dressed up and really got into their own character, complete with accents! Our ship was constantly changing course across the Atlantic and all sorts of bribery and deception took place – great fun, thank you!" "Everyone thoroughly enjoyed All at Sea. We had a lot of fun, played outside in beautiful weather, ate lots of good food and everyone is looking forward to our next game. The game cards, secrets, abilities, etc. is a very good touch." "We really enjoyed All at Sea, and in fact we extended the play to give more performing time!" 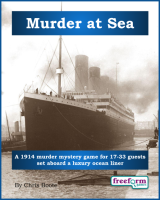 Murder at Sea is a dinner party murder mystery game for 17 to 33 guests and one or two hosts – download the free introductory pdf file. Join us in a thrilling evening of plotting, mystery and treachery. You will be in the middle of the action and it will be up to you to wheel and deal with the other guests. Can you achieve your goals, keep your secrets hidden and survive Murder at Sea? It's up to you. Who killed Captain Bayard – and why? Find out in Murder at Sea. Murder at Sea lasts for about four hours and is suited to an evening. It is often played over a meal – a finger buffet if possible to allow guests to circulate and talk in private. "I really enjoyed All at Sea and thought that your materials were extremely well done. " Aggie Marbles – Amateur sleuth and friend of the Finkelsteins. Albert Wiggin – English travel writer. Armin Oberhausen – Maximillian von Grafenberg's ambitious assistant. Candice Dumlop – American socialite and Eldon Dumlop II's wife. Catherine New – One of the Libertania's stewardesses. Chief Engineer Brynneth Cawdra – Libertania's Welsh Chief Engineer. Chief Purser Chris Gamble – Libertania's American Chief Purser. Clark Ridgeway – PJ Nichols's manager. Cynthia Petal – One of the Libertania's stewardesses. Eldon Dumlop II – Rich American socialite. Elizabeth James – Sir Ranulph Royston's 19 year old daughter. Engineer Reiner Tanhauser – One of Libertania's engineers. Entertainments Officer Vic Hammerstein – Libertania's American Entertainments Officer. Eric Lassiter – Trainee Steward aboard the Libertania. First Officer Daniel Warren – Libertania's popular American First Officer. Gilbert Ryce – American Secretary of State. Jennifer Floreste – Libertania's American caberet singer. Jeremiah Finkelstein – American industrial businessman. Julilia Morteblanca – Libertania's Italian cocktail stewardess. Lady Isabelle Canter – Sir Rory Canter's wife and previously an actress. Lou Noble – American journalist. Marie Hati – Glamorous French journalist. Master Chef Blaise de Richelieu – Libertania's temperamental French chef. Maximillian von Grafenberg – German Procurement Minister. Patrick Malloy – Libertania's Irish padre. PJ Nichols – Music-hall entertainer and singer. Rachel Finkelstein – Jeremiah Finkelstein's wife and business partner. Sasha Alexandrovich Ilyatkin – Russian Minister. Second Officer David Whitworth – Libertania's competent Second Officer. Sir Ranulph Royston – British Minister of War. Sir Rory Canter – English Baronet and rumoured to be the richest man in Great Britain. Third Officer Christina Younger – Libertania's female Third Officer. Wilma Drew – Gilbert Ryce's assistant. Murder at Sea is unlike many murder mystery games. Although the game starts with a murder, most of the characters have more important things to do than to investigate it. And the killing may not be over – it is unlikely that everyone will survive the remainder of the journey! Murder at Sea is played just like a murder mystery game. You may be trying to solve the murder, but primarily you are (initially at least) concentrating on your own goals and objectives. Unlike most boxed murder mystery games, Murder at Sea lets you decide how to achieve your goals and thwart your enemies. "Many of the people who came to play All at Sea were new to freeform games. We had a great time! Thanks!" Murder at Sea costs £30.00 (GB pounds) or US $49.99. You can buy it in either currency, from anywhere in the world, as you prefer. The price will be converted back into your own currency for you, at today's exchange rate. We offer a Cast Iron Guarantee on all our murder mystery games. If you're not completely satisfied with Murder at Sea then please let us know within 30 days and we will refund you. See our full terms and conditions here.